The US labor movement is in deep trouble. For the past forty years (and, some would argue, even longer), the capitalist class and its political representatives in both parties have waged a vicious offensive against working people. Employers across the economy have demanded tremendous concessions from their unionized employees — wage, benefit, and work-rule givebacks; the introduction of multi-tiered workforces; the outsourcing of work to nonunion subsidiaries and companies — all while fighting union organizing drives at their new facilities. In the political arena, capital’s loyal servants have blocked any substantial pro-worker reform of labor law and gutted the social welfare state, which provided minimal protections against the worst aspects of labor-market competition. The results of the offensive are well known: growing inequality and insecurity that have created a fertile ecosystem for the growth of racism, xenophobia, sexism, and homophobia among a significant minority of workers. Despite the expectations of the generation radicalized in the 1960s and early 1970s, this decades-long onslaught has been met with relatively little resistance. There have, of course, been some struggles against concessions and austerity: the strike at Hormel in 1985–86; the near-simultaneous strikes against Bridgestone-Firestone, Caterpillar, and Staley in 1994–96; the UPS strike of 1997; the New York City transit strike of 2005; and the Chicago Teachers Union (CTU) strike of 2012. But with the partial exceptions of the UPS and teachers’ strikes, most of these struggles ended in defeat. Even more importantly, the level of organized fightback at the workplace is extremely low. The number of workdays lost from strikes has dropped to historic lows, and the percentage of employed workers who are union members declined to about 11 percent in 2014, the lowest share in a century. What explains the disturbingly small amount of working-class resistance in the United States today? One popular argument on the Left is that the US labor movement faces unprecedented hostility from employers, who are abetted by a legal environment that is unfavorable to labor. This argument, however, does not withstand historical scrutiny. The CIO made its most important breakthroughs in the 1930s, in the face of much greater employer animosity (at times rising to the level of armed force) and before the Supreme Court upheld the National Labor Relations Act (NLRA) in 1937. Likewise, when public-sector workers organized en masse in the 1960s and 1970s, their unions often made significant gains despite sustained employer opposition and before new state and local laws gave them collective bargaining rights. Labor-law reform in the United States has followed working-class upsurges, not preceded them. Other explanations for minimal working-class resistance emphasize the changes in the structure and composition of the working class. Most common is the claim that the industrial working class has disappeared with “globalization” and “deindustrialization.” In this schema, the mass-production industries whose workers formed the backbone of unionism have either disappeared or moved to the Global South. The reality is much more complex. For starters, manufacturing’s role in the US economy has actually grown — the final production of goods rose from 22 percent of real GDP during the 1960s and 1970s to 28 percent in the 2000s, and inched upwards to 31 percent by 2010–12. While it is true that the percentage of manufacturing workers has been declining, this decrease began in the late 1890s. Even more importantly, industrial union membership has fallen more rapidly than manufacturing employment: Between 1994 and 2013 (as a result of rising productivity and industrial restructuring), the number of production workers decreased 33 percent, while industrial union membership dropped 60 percent. Nor can shifts in the labor process account for the fall-off in working-class combativeness. Despite claims that deskilling through computerization has eliminated industrial workers’ ability to stop production, there is clear evidence that these workers still retain potential social power. In fact, the spread of “just-in-time” inventory systems — which eliminate reserves of parts and materials — has increased the ability of industrial workers in logistics to disrupt manufacturing. It’s also unclear whether computerization has actually reduced manufacturing workers to “gauge readers.” Even if these claims were true, computerization puts enormous power in the hands of the workers who set up and maintain these new machines. Deskilled workers could halt production by staying at their machines, a twenty-first-century version of the 1930s sit-down strikes. Perhaps the most widespread explanation on the contemporary left for the decline in working-class militancy is that full-time, long-term employment has been supplanted by part-time, temporary jobs. The growth of the “precariat,” in this view, has undermined workers’ power at the point of production. These claims, however, are showing up everywhere but in the data. While the number of precarious workers (performing temporary agency work, on-call work, and involuntary part-time work, or laboring under a short contract or as an independent contractor) grew by 3 million between 1995 and 2005, the percentage of precarious workers has increased only three-tenths of 1 percent, from 15.2 percent to 15.5 percent. Similarly, a 2015 report by the Government Accountability Office estimated that those classified as “core contingent” (agency temps, on-call workers, etc.) made up around 7.9 percent of the workforce. Even the growth of part-time employment (especially in retail and health care) hasn’t reduced these workers’ attachment to a single employer. The number of years these part-time workers stay with a single employer has not significantly decreased in the past twenty years. For a more persuasive account of workers’ flagging militancy, we’ll need to look elsewhere. As Mike Goldfield, Kim Moody, Joe Burns, and others have noted, a change in the relationship of class forces, beginning in the late 1950s and intensifying after the late 1970s, created a crisis of strategy for the official leadership of the AFL-CIO. Since the late 1940s, labor officialdom in the United States had acted within the framework set out by the NLRA. New organizing took place through National Labor Relations Board–sponsored elections, which determined the composition of “bargaining units” (often only a fraction of the workforce in a given firm or industry). Routine bargaining with “target” employers produced multi-year contracts that then set patterns for the rest of the industry. Institutionalization severely blunted worker militancy. Strikes were limited to periods after the expiration of contracts and were restricted in tactics (no secondary boycotts, no factory occupations, etc.). During the life of the contract, all workplace struggles were channeled into the grievance procedure, which compelled workers to keep doing unfair or dangerous tasks while the complaint proceeded through the lengthy process of hearings and arbitration. Finally, labor’s political activity began and ended with supporting the Democratic Party. For a few decades, the AFL-CIO’s strategy paid off in some respects. Unionized industrial workers won wage increases that generally kept up with inflation, enjoyed “private welfare states” in the form of employer-provided health care and pensions, and were protected from the worst abuses of management by complex job categories and work rules. Some industrial unions (e.g., the United Auto Workers and United Rubber Workers) successfully organized new plants in the generally nonunion South before the late 1970s. Even at the strategy’s peak, however, there were significant drawbacks. For one, the labor bureaucracy’s alliance with the Democrats secured few federal policies that benefited all workers, sharpening the division between organized and (disproportionately female and nonwhite) unorganized workers. In addition, the viability of this bureaucratic business unionism was premised on the existence of a capitalist class that could and would make concessions in exchange for uninterrupted production. The crisis of profitability that began in the mid 1960s and intensified global competition in the mid 1970s trans­-formed capital’s relationship to organized labor. Faced with falling returns and unprecedented challenges to their postwar global dominance, US capitalists went on the offensive. They began to demand concessions in 1979. The AFL-CIO leadership, prisoners of their strategic alliance with the NLRB and the Democrats, responded by agreeing to givebacks and attempting to convince employers that they were potential “partners” who could make US corporations more profitable and competitive. Conciliation was a disaster. Organized labor declined across the United States, and wages, benefits, and working conditions deteriorated throughout the economy. The crisis of strategy is a necessary but not a sufficient explanation for the decline of working-class resistance in the United States. There’s a reason why, as Robert Brenner and others have pointed out, labor officialdom clings to its failed strategies. But what explains the lack of struggles from below? Why haven’t the labor rank-and-file repelled the employer offensive with more gusto? In short: the dwindling size and political disorganization of the “militant minority.” Without a layer of workers with a vision and strategy for how to organize, fight, and win, labor officials have been free to pursue their near-suicidal approach. The uneven development of working-class consciousness is rooted in the necessarily episodic character of class struggle under capitalism. Mass struggles that involve mounting confrontations with employers and the state are necessary to developing working-class radicalism and consciousness. But because workers rely on selling their labor power for wages to survive, most cannot permanently engage in strikes, demonstrations, occupations, and the like. Only during brief upsurges are large segments of workers swept into struggle — most of the time, they’re too busy just trying to get by. While the labor bureaucracy’s privileged condition of life is the basis for its unconditional commitment to reformist strategies (routine bargaining, grievance procedures, Democratic Party electoral campaigns, etc. ), the mass of workers conditionally support these efforts in the hopes of improving their conditions without the risk of struggle. This pivotal group — politically heterogeneous and comprised of shop stewards and other workplace leaders who have led shop-floor struggles and promoted radical politics in the working class — is the militant minority. In the 1870s and 1880s, massive strike waves in the United States left in their wake two distinct layers of the labor movement: an officialdom of business unionists who secured urban monopolies on the supply of skilled labor, and a militant minority of workers grouped around the flourishing local labor press and the fragmented socialist and anarchist left. In the long economic expansion before World War I, these militants (skilled industrial workers, garment workers, and miners) cohered around the left wing of the Socialist Party and joined the Industrial Workers of the World — the most important organization of the pre-1917 militant minority. Postwar repression did not eliminate this crucial group, but saw its reorganization into the Communist Party (CP) and the Trade Union Education League (TUEL), a united front of labor radicals that sought to transform the existing AFL unions and organize the unorganized. By the early 1930s, syndicalists, left socialists, and communists of various stripes had embraced a strategy that called for independence from labor officials, militancy in confronting employers and the state, solidarity with other workers’ struggles, and democratic industrial unionism. They put it into practice with great effect in the mid 1930s, leading the strikes that would create the CIO. At the time, the CP laid claim to being the militant minority’s most important organization. While politically subordinate to the Soviet leadership beginning in the late 1920s, the party boasted the largest slice of radical workers. The CP was especially influential during the brief interregnum between the ultra-leftism of the Third Period (1928–33), when it abandoned work in the existing unions, and the reformism of the Popular Front (post-1936). For those three years, the CP provided a genuine alternative to the AFL. But the CP’s embrace of the Popular Front strategy clipped the CIO’s and militant minority’s wings immediately. 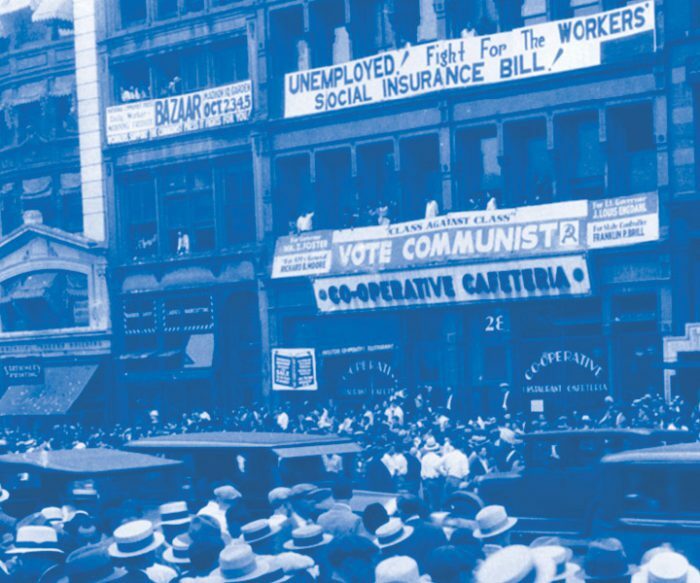 The Communists were transformed from advocates of working-class political independence into foot soldiers for Roosevelt’s 1936 reelection campaign. Under the new strategy, the CP linked arms with labor leaders John L. Lewis and Philip Murray — whom the CP viewed as progressive for their support of Roosevelt and a collective security agreement with the Soviet Union — and the emerging CIO bureaucracy. To maintain this alliance and win staff jobs for their members, Communist unionists used their influence in the CIO unions to block the spread of sit-down strikes. Their smothering of the militant tactics and forms of organization that had been crucial to the CIO’s successes in 1936–37 contributed to the defeat of the “Little Steel” strike in 1937 and the end of the CIO’s first wave of growth. During World War II, the Communists’ integration into the lower and middle ranks of the CIO bureaucracy deepened, further isolating them from the rank-and-file. When the leaders of both the AFL and the CIO signed a no-strike pledge, the Communists didn’t merely lend their own imprimatur — they became its most zealous enforcers. The Communists denounced, for instance, the United Mine Workers’ strike in 1943. Even more tragic was the role of Communist shop stewards, local officers, and regional staffers in the auto, steel, and rubber industries throughout the war. Communist union officials, often elected as militants, stood shoulder to shoulder with management to reprimand and fire workers who launched unauthorized strikes over wages and working conditions. By the end of the war, the Communists’ role as labor disciplinarians had created a gulf between them and CIO workers. The advent of the Cold War cut short the CP’s integration into the CIO bureaucracy. As the US ruling class assumed leadership of the capitalist world, it broke its wartime alliance with the Soviet Union and sought to “contain” Communism. At home, both Democrats and Republicans used the specter of Communism to root out all forms of domestic radicalism. The leaders of the CIO succumbed to the zeitgeist as well, purging Communists and other radicals in the late 1940s and 1950s out of allegiance to the Truman administration. In the decades after the AFL-CIO’s 1955 merger, the divorce between socialist politics and working-class life protected the labor bureaucracy from significant opposition. While bureaucratic business unionism secured increased wages and benefits for members, unions’ reliance on the grievance procedure weakened their ability to challenge the intensification of work and deteriorating workplace health and safety standards. From 1965 to 1975, many young workers — especially workers of color emboldened by the social movements of the period — led thousands of unofficial strikes, initiated electoral challenges to entrenched union leaders, and forced labor bigwigs to call national strikes against employers. Yet the absence of a nationally organized political organization like the TUEL — rooted in workplaces and capable of knitting together these rebellions into a cross-union network — meant the leadership could rest easy. When the explosion of activity ebbed and the employers resumed their offensive — soon aided by the 1980–82 recession — labor officialdom’s capitulations elicited relatively little opposition from the rank-and-file. The decades since have witnessed the occasional efflorescence of mass struggle, but no broad-based militant minority. Teamsters for a Democratic Union (TDU) persevered as the only nationally organized opposition in an existing union. Various rank-and-file reform movements emerged, most notably New Directions in the New York City Transport Workers Union and the Coalition of Rank and File Educators (CORE) in the Chicago Teachers Union. However, most of the attempts to build rank-and-file opposition to labor leaders’ policy of retreat were defeated, disorganized, or isolated in a single local. These are the bitter fruits of the militant minority’s disappearance. Today, rebuilding a militant minority committed to a politics of solidarity, democracy, and political independence is the key to reviving working-class resistance and radicalism in the United States. Indeed, it’s telling that the only successful strikes of the past thirty years were the products of independent organizing by rank-and-file reform groups like TDU and CORE. Socialists need to prioritize rebuilding this layer of worker activists, which is today gathered around Labor Notes and its newsletter, books, Troublemakers’ Schools, and biannual conferences. A project to grow this militant minority will need to go beyond the NLRB framework by reviving workers’ willingness to break the law in order to build successful resistance and organize the unorganized. While this work will be difficult and prolonged — we should not expect quick and easy breakthroughs — it is essential if we are to see a reversal of the relationship of class forces and the creation of a mass audience among workers for political radicalism.